Battery Park City is a mainly residential 92-acre (37 ha) planned community on the west side of the southern tip of the island of Manhattan in New York City. It is bounded by the Hudson River on the west, the Hudson River shoreline on the north and south, and the West Side Highway on the east. More than one-third of the development is parkland. The land upon which it is built was created by land reclamation on the Hudson River using over 3 million cubic yards (2.3×10^6 m3) of soil and rock excavated during the construction of the World Trade Center, the New York City Water Tunnel, and certain other construction projects, as well as from sand dredged from New York Harbor off Staten Island. 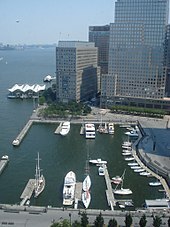 The neighborhood, which is the site of Brookfield Place (formerly the World Financial Center), along with numerous buildings designed for housing, commercial, and retail, is named for adjacent Battery Park. Battery Park City is part of Manhattan Community District 1 and its primary ZIP Codes are 10280 and 10282. It is patrolled by the 1st Precinct of the New York City Police Department. Battery Park City is bounded on the east by West Street, which separates the area from the Financial District of Lower Manhattan. To the west, north, and south, the area is surrounded by the Hudson River. The development consists of roughly five major sections. Traveling north to south, the first neighborhood has high-rise residential buildings, the Stuyvesant High School, a Regal Entertainment Group movie theater, and the Battery Park City branch of the New York Public Library. It is also the site of the 463-suite Conrad New York luxury hotel, which contains restaurants and bars such as the Loopy Doopy Rooftop Bar, ATRIO Wine Bar Restaurant, Mexican-themed El Vez, and three Danny Meyer-branded restaurants (North End Grill, Blue Smoke, Shake Shack); the hotel has a ballroom and a conference center. Other restaurants located in that hotel, as well as a DSW store and a New York Sports Club branch, were closed in 2009 after the takeover of the property by Goldman Sachs. Former undeveloped lots in the area have been developed into high-rise buildings; for example, Goldman Sachs built a new headquarters at 200 West Street. Nearby is Brookfield Place, a complex of several commercial buildings formerly known as the World Financial Center. Current residential neighborhoods of Battery Park City are divided into northern and southern sections, separated by Brookfield Place. The northern section consists entirely of large, 20–45-story buildings, all various shades of orange brick. The southern section, extending down from the Winter Garden, which is located in Brookfield Place, contains residential apartment buildings such as Gateway Plaza and the Rector Place apartment buildings. In this section lies the majority of Battery Park City's residential areas, in three sections: Gateway Plaza, a high-rise building complex; the "Rector Place Residential Neighborhood"; and the" Battery Place Residential Neighborhood". These subsections contain most of the area's residential buildings, along with park space, supermarkets, restaurants, and movie theaters. Construction of residential buildings began north of the World Financial Center in the late 1990s, and completion of the final lots took place in early 2011. Additionally, a park restoration was completed in 2013. Throughout the 19th century and early 20th century, the area adjoining today's Battery Park City was known as Little Syria with Lebanese, Greeks, Armenians, and other ethnic groups. In 1929, the land was the proposed site of a $50,000,000 residential development that would have served workers in the Wall Street area. The Battery Tower project was left unfinished after workers digging the foundation ran into forty feet of old bulkheads, sunken docks, and ships. Construction was halted and never restarted. By the late 1950s, the once-prosperous port area of downtown Manhattan was occupied by a number of dilapidated shipping piers, casualties of the rise of container shipping which drove sea traffic to Port Elizabeth, New Jersey. The initial proposal to reclaim this area through landfill was offered in the early 1960s by private firms and supported by the mayor. That plan became complicated when Governor Nelson Rockefeller announced his desire to redevelop a part of the area as a separate project. The various groups reached a compromise, and in 1966 the governor unveiled the proposal for what would become Battery Park City. The creation of architect Wallace K. Harrison, the proposal called for a 'comprehensive community' consisting of housing, social infrastructure and light industry. The landscaping of the park space and later the Winter Garden was designed by M. Paul Friedberg. In 1968, the New York State Legislature created the Battery Park City Authority (BPCA) to oversee development. Rockefeller named Charles J. Urstadt as the first chairman of the authority’s board that year. He then served as the chief executive officer from 1973 to 1978. Urstadt later served as the authority’s vice chair from 1996 to 2010. The New York State Urban Development Corporation and ten other public agencies were also involved in the development project. For the next several years, the BPCA made slow progress. In April 1969, it unveiled a master plan for the area, which was approved in October. In early 1972, the BPCA issued $200 million in bonds to fund construction efforts, with Harry B. Helmsley designated as the developer. That same year, the city approved plans to alter the number of apartments designated for lower, middle and upper income renters. Urstadt said the changes were needed to make the financing for the project viable. In addition to the change in the mix of units, the city approved adding nine acres, which extended the northern boundary from Reade Street to Duane Street. Landfill material from construction of the World Trade Center was used to add fill for the southern portion. Cellular cofferdams were constructed to retain the material. After removal of the piers, wooden piles and overburden of silt, the northern portion (north of, and including the marina) was filled with sand dredged from areas adjacent to Ambrose Channel in the Atlantic Ocean, as well as stone from the construction of Water Tunnel #3. By 1976, the landfill was completed. Seating stands for viewing the American Bicentennial "Operation Sail" flotilla parade were set up on the completed landfill in July 1976. Construction efforts ground to a halt in 1977, as a result of the city's fiscal crisis. That year, the presidential administration of Jimmy Carter approved mortgage insurance for 1,600 of the development's proposed units. In 1979, the title to the landfill was transferred from the city to the Battery Park City Authority, which financially restructured itself and created a new, more viable master plan, designed by Alex Cooper and Stanton Eckstut. By that time, only two of the proposed development's buildings had been built, and the $200 million bond issue was supposed to have been paid off the next year. The design of BPC to some degree reflects the values of vibrant city neighborhoods championed by Jane Jacobs. The Urban Land Institute (ULI) awarded the Battery Park City Master Plan its 2010 Heritage Award, for having "facilitated the private development of 9.3 million square feet of commercial space, 7.2 million square feet of residential space, and nearly 36 acres of open space in lower Manhattan, becoming a model for successful large-scale planning efforts and marking a positive shift away from the urban renewal mindset of the time." During the late 1970s and early 1980s, the site hosted Creative Time's landmark Art on the Beach sculpture exhibitions. On September 23, 1979, the landfill was the site of an anti-nuclear rally attended by 200,000 people. Construction began on the first residential building in June 1980. In April 1981, the New York State Urban Development Corporation (now the Empire State Development Corporation) issued a request for proposal, ultimately selecting six real-estate companies to develop over 1,800 residential units. The same year, the World Financial Center started construction; Olympia and York of Toronto was named as the developer for the World Financial Center, who then hired Cesar Pelli as the lead architect. By 1985, construction was completed and the World Financial Center (later renamed Brookfield Place New York) saw its first tenants. The newly completed development was lauded by The New York Times as "a triumph of urban design," with the World Financial Center being deemed "a symbol of change." During early construction, two acres of land in the southern section of the Battery Park landfill was used by artist Agnes Denes to plant wheat in an exhibition titled Wheatfield - A Confrontation. The project was a visual contradiction: a golden field of wheat set among the steel skyscrapers of downtown Manhattan. It was created during a six-month period in the spring, summer, and fall of 1982 when Denes, with the support of the Public Art Fund, planted the field of wheat on rubble-strewn land near Wall Street and the World Trade Center site. Denes stated that her "decision to plant a wheatfield in Manhattan, instead of designing just another public sculpture, grew out of a long-standing concern and need to call attention to our misplaced priorities and deteriorating human values." Throughout the 1980s, the BPCA oversaw a great deal of construction, including the entire Rector Place neighborhood and the river esplanade. It was during that period that Amanda Burden, later City Planning Department Director in the Bloomberg administration, worked on Battery Park City. During the 1980s, a total of 13 buildings were constructed. The Vietnam Veterans Plaza was established by Edward I. Koch in 1985. In the early 1990s, Battery Park City became the new home of the Stuyvesant High School. During the 1990s, an additional six buildings were added to the neighborhood. By the turn of the 21st century, Battery Park City was mostly completed, with the exception of some ongoing construction on West Street. Initially, in the 1980s, 23 buildings were built in the area. By the 1990s, 9 more buildings were built, followed by the construction of 11 buildings in the 2000s and 3 buildings in the 2010s. The Battery Park City Authority, wishing to attract more middle-class residents, started providing subsidies in 1998 to households whose annual incomes were $108,000 or less. By the end of the decade, nearly the entire landfill had been developed. The September 11 attacks in 2001 had a major impact on Battery Park City. The residents of Lower Manhattan and particularly of Battery Park City were displaced for an extended period of time. Parts of the community were an official crime-scene and therefore residents were unable to return to live or even collect property. Many of the displaced residents were not allowed to return to the area for months and none were given government guidance of where to live temporarily on the already crowded island of Manhattan. With most hotel rooms booked, residents, including young children and the elderly were forced to fend for themselves. When they were finally allowed to return to Battery Park City, some found that their homes had been looted. Upon residents' return, the air in the area was still filled with toxic smoke from the World Trade Center fires that persisted until December 2001. More than half of the area's residents moved away permanently from the community after the adjacent World Trade Center towers collapsed and spread toxic dust, debris, and smoke. Gateway Plaza's 600 building, Hudson View East, and Parc Place (now Rector Square) were punctured by airplane parts. The Winter Garden and other portions of the World Financial Center were severely damaged. Environmental concerns regarding dust from the Trade Center are a continuing source of concern for many residents, scientists, and elected officials. Since the attacks, the damage has been repaired. Temporarily reduced rents and government subsidies helped restore residential occupancy in the years following the attacks. After September 11, 2001, residents of Battery Park City and Tribeca formed the TriBattery Pops Tom Goodkind Conductor in response to the events of the attacks. The “Pops” have been Grammy-nominated and are the first lower Manhattan all-volunteer community band in a century. Since then, real estate development in the area has continued robustly. Commercial development includes the 2,100,000-square-foot (200,000 m2) 200 West Street, the Goldman Sachs global headquarters, which began construction in 2005 and opened for occupancy in October 2009. 200 West Street is seeking gold-level certification under the United States Green Building Council’s Leadership in Energy and Environmental Design (LEED) program by incorporating various water and energy conservation features. Several residential projects are underway,[when?] including LEED buildings which cater to the environmentally conscious. Battery Park City is owned and managed by the Hugh L. Carey Battery Park City Authority (BPCA), a Class A New York State public-benefit corporation created by New York State in 1968 to redevelop outmoded and deteriorated piers, a project that has involved reclaiming the land, replanning the area and facilitating new construction of a mixed commercial and residential community. It has operated under the authority of the Urban Development Corporation. Its mission is "to plan, create, co-ordinate and maintain a balanced community of commercial, residential, retail, and park space within its designated 92-acre site on the lower west side of Manhattan" in New York City. The authority's board is composed of seven uncompensated members who are appointed by the governor and who serve six-year terms. B.J. Jones is the President & Chief Executive Officer. The BPCA is invested with substantial powers: it can acquire, hold and dispose of real property, enter into lease agreements, borrow money and issue debt, and manage the project. Like other public benefit corporations, the BPCA is exempt from property taxes and has the ability to issue tax exempt bonds. In 2017, the BPCA had operating expenses of $47.73 million as well as an outstanding debt of $982.85 million, and it employed 240 people. Under the 1989 agreement between the BPCA and the City of New York, $600 million was transferred by the BPCA to the city. Charles J. Urstadt, the first Chairman and CEO of the BPCA, noted in an August 19, 2007 op-ed piece in the New York Post that the aggregate figure of funds transferred to the City of New York is above $1.4 billion, with the BPCA continuing to contribute $200 million a year. Excess revenue from the area was to be contributed to other housing efforts, typically low-income projects in the Bronx and Harlem. Much of this funding has historically been diverted to general city expenses, under section 3.d of the 1989 agreement. However, in July 2006, Mayor Michael Bloomberg, Governor George Pataki, and Comptroller William C. Thompson, Jr. announced the final approval for the New York City Housing Trust Fund derived from $130 million in Battery Park City revenues. The fund aimed to preserve or create 4,300 units of low- and moderate-income housing by 2009. It also provided seed financing for the New York Acquisition Fund, a $230 million initiative that aims to serve as a catalyst for the construction and preservation of more than 30,000 units of affordable housing citywide by 2016. The Acquisition Fund has since established itself as a model for similar funds in cities and states across the country. By 2018, thirty residential buildings had been built in Battery Park City and no new construction was planned. The Battery Park City Authority’s main focus turned to maintenance of existing infrastructure, security and conservancy of the public spaces. The authority was creating over 1,000 free activities per year. Condo owners in Battery Park City pay higher monthly charges than owners of comparable apartments elsewhere in New York City because residents pay their building's common charges in addition to PILOT (payments in lieu of taxes). The PILOT payments replace real estate taxes and the land lease. As a result, residential units have higher monthly costs compared to other neighborhoods. The cumulative effect is lower property values for homeowners. Because none of the properties in Battery Park City own the land they are built on, many banks have refused to write loans when those ground leases are periodically up for renewal. This has been a regular source of anger and frustration for owners in Battery Park City who are looking to sell. For census purposes, the New York City government classifies Battery Park City as part of a larger neighborhood tabulation area called Battery Park City-Lower Manhattan. Based on data from the 2010 United States Census, the population of Battery Park City-Lower Manhattan was 39,699, an increase of 19,611 (97.6%) from the 20,088 counted in 2000. Covering an area of 479.77 acres (194.16 ha), the neighborhood had a population density of 82.7 inhabitants per acre (52,900/sq mi; 20,400/km2). The racial makeup of the neighborhood was 65.4% (25,965) White, 3.2% (1,288) African American, 0.1% (35) Native American, 20.2% (8,016) Asian, 0.0% (17) Pacific Islander, 0.4% (153) from other races, and 3.0% (1,170) from two or more races. Hispanic or Latino of any race were 7.7% (3,055) of the population. As of 2007[update], about 10,000 people live in Battery Park City, most of whom are upper middle class and upper class (54.0% of households have incomes over $100,000). When fully built out, the neighborhood is projected to have 14,000 residents. A largely Arab-American neighborhood existed adjacent to what is today southeastern Battery Park City from the late 1880s to the 1940s. "Little Syria" encompassed Washington Street from Battery Park to Rector Street. It declined as a neighborhood as the inhabitants became successful and moved to other areas, especially Atlantic Avenue in Brooklyn, and disappeared almost entirely when a great deal of lower Washington Street was demolished to make way for entrance ramps to the Brooklyn-Battery Tunnel, which opened in 1950. The overwhelming majority of the residents were Arabic-speaking Christians, Melkite and Maronite immigrants from present-day Syria and Lebanon who settled in the area in the late 19th century, escaping religious persecution and poverty in their homelands – which were then under control of the Ottoman Empire – and answering the call of American missionaries to escape their difficulties by traveling to New York City. However, many other ethnic groups had lived in this diverse neighborhood, including Greeks, Turks, Armenians, Slovaks, Poles, Hungarians, Lithuanians, Ukrainians, Czechs, and Irish. A long-standing reminder of the ethnic past was the former St. Nicholas Greek Orthodox Church, which was destroyed in the September 11 attacks. An additional historic church, St. George's Syrian Catholic Church, still stands at 103 Washington Street. Southern part of Battery Park City; Millennium Point is shown. Millennium Point, a 449-foot (137 m), 38-story skyscraper built from 1999 to 2001. It occupies the street addresses 25–39 Battery Place. However, due to the September 11 attacks which hit the nearby World Trade Center, opening of Millennium Point was delayed until January 2002. The building won the 2001 Silver Emporis Skyscraper Award. The tower section contains 113 luxury condominiums. The wider, lower 12 floors are occupied by a 5-star hotel, The Ritz-Carlton Battery Park. The hotel has 298 rooms, including 44 suites, with the largest suite spanning 200 square metres (2,150 sq ft) in area. The Skyscraper Museum occupies a small space on the first floor of the building. A restaurant is located on the 14th floor. The Solaire, the first green residential building in the United States, as well as the first residential high-rise building in New York City to be certified by the U.S. Green Building Council. Designed by Pelli Clarke Pelli and completed in 2003, it has been described as an "environmentally-progressive residential tower". The Solaire is located at 20 River Terrace. The developer received funding from the State of New York, which was somewhat controversial as the developer was only required to agree to set aside 10% of the units as "affordable housing" or "moderate income", rather than the usual 80:20 agreement. When the building opened, rents ranged from roughly $2,500 to $9,001 depending on the size of the unit. The building has been rated LEED Platinum. The energy conserving building design is 35% more energy-efficient than code requires, resulting in a 67% lower electricity demand during peak hours, resulting in, among other benefits, lower electric bills for residents. Photovoltaic panels convert sunlight to electricity, supplemented by a computerized building management system and environmentally responsible operating and maintenance practices to further reduce the building's environmental impact. Battery Park City, which is mainly residential, also has a few office buildings. The seven buildings in the Brookfield Place complex, as well as 200 West Street, are the neighborhood's only office buildings. Located in the middle of Battery Park City and overlooking the Hudson River, Brookfield Place, designed by César Pelli and owned mostly by Toronto-based Brookfield Office Properties, has been home to offices of various major companies, including Merrill Lynch, RBC Capital Markets, Nomura Group, American Express and Brookfield Asset Management, among others. Brookfield Place also serves as the United States headquarters for Brookfield Office Properties, which has its headquarters located in 200 Vesey Street. Brookfield Place also has its own zip code, 10281. Brookfield Place's ground floor and portions of the second floor are occupied by a mall; its center point is a steel-and-glass atrium known as the Winter Garden. Outside of the Winter Garden lies a sizeable yacht harbor on the Hudson known as North Cove. The building's original developer was Olympia and York of Toronto, Ontario. It used to be named the World Financial Center, but in 2014, the complex was given its current name following the completion of extensive renovations. The World Financial Center complex was built by Olympia and York between 1982 and 1988; it was damaged in the September 11 attacks but later repaired. It has six constituent buildings – 200 Liberty Street, 225 Liberty Street, 200 Vesey Street, 250 Vesey Street, the Winter Garden Atrium, and One North End Avenue (a.k.a. the New York Mercantile Exchange building). 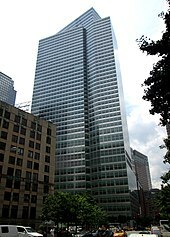 200 West Street is the location of the global headquarters of Goldman Sachs, an investment banking firm. A 749-foot-tall (228 m), 44-story building located on the west side of West Street between Vesey and Murray Streets, it is north of Brookfield Place and the Conrad Hotels, across the street from the Verizon Building, and diagonally opposite the World Trade Center. It is distinctive for being the only office building in the northern section of Battery Park City. It started construction in 2005 and opened in 2009. Battery Park City is served by the New York City Fire Department (FDNY)'s Engine Co. 10/Ladder Co. 10 fire station, located at 124 Liberty Street. Battery Park City is located within two ZIP Codes. The neighborhood north of Brookfield Place is covered by 10282, while much of the neighborhood south of Brookfield Place is covered by 10280. Brookfield Place is part of 10281, and the southernmost tip is part of 10004. The United States Postal Service does not operate any post offices in Battery Park City. The nearest post office is the Church Street Station at 90 Church Street in the Financial District. Battery Park City and Lower Manhattan generally have a higher rate of college-educated residents than the rest of the city. The vast majority of residents age 25 and older (84%) have a college education or higher, while 4% have less than a high school education and 12% are high school graduates or have some college education. By contrast, 64% of Manhattan residents and 43% of city residents have a college education or higher. :6 The percentage of Battery Park City and Lower Manhattan students excelling in math rose from 61% in 2000 to 80% in 2011, and reading achievement increased from 66% to 68% during the same time period. Battery Park City has a New York Public Library branch at 175 North End Avenue, designed by 1100 Architect and completed in 2010. A 10,000-square-foot (930-square-metre), two-story library on the street level of a high-rise residential building, it utilizes several sustainable design features, earning it LEED Gold certification. Sustainability was a driving factor in the design of the library including use of an energy-efficient lighting system, maximization of natural lighting, and use of recycled materials. 1100 Architect, in collaboration with Atelier Ten, an international team of environmental design consultants and building services engineers, designed the library’s energy-efficient lighting system. The open plan layout and large use of glass allow for ample natural daylight year-round and low-energy LED light illuminates communal spaces. Recycled materials are incorporated into the design including carpet made from re-purposed truck tires, floors made from reclaimed window frame wood, and furniture made from FSC-certified plywood and recycled steel. Design features include a seemingly "floating" origami-style ceiling made up of triangular panels hung at varying angles and a padded reading nook fitted into the library's terrazzo-finished steel and concrete staircase. The interior uses an easy-to-navigate layout with its three distinct spatial areas of entry area, first floor space, and mezzanine visually unified through the ceiling. The building also won the Interior Design, Best of Year Merit Award in 2011, followed by The National Terrazzo and Mosaic Association, Port Morris Tile and Marble Corporation Craftsmanship Award in 2011 and the Contract, Public Space Interiors Award in 2012. Currently, the Metropolitan Transportation Authority provides bus service to the area. As of October 2014[update], the M9, M20 and M22 bus lines service parts of Battery Park City, with the M15 and M15 SBS nearby at Battery Park. Additionally, the Downtown Alliance provides a free bus service that runs along North End Avenue and South End Avenue, connecting the various residential complexes with subway stations on the other side of West Street. There is currently no New York City Subway access in Battery Park City proper; however, the West Street pedestrian bridges, as well as crosswalks across West Street, connect Battery Park City to subway stations and the PATH station in the nearby Financial District. A tunnel from Brookfield Place under West Street also provides access from Battery Park City to the World Trade Center PATH station. The Battery Park City Ferry Terminal is at the foot of Vesey Street opposite the New York Mercantile Exchange and provides ferry transportation to various points in New Jersey via NY Waterway and Liberty Water Taxi routes. NYC Ferry's St. George route, to West Midtown Ferry Terminal and St. George Terminal, will stop at Battery Park City Ferry Terminal beginning in 2020. More than one-third of the neighborhood is parkland. Teardrop Park sits midblock, near the corner of Warren Street and River Terrace. Before construction, the site was empty and flat; part of the neighborhood's development plan, the park was designed in anticipation of four high residential towers on its west and east. Although a New York City public park, maintenance is overseen by the Battery Park City Parks Conservancy and the park was designed for the Battery Park City Authority. The park opened on September 30, 2004. There is also a southern extension to this park. Washington Street Plaza, a pedestrian plaza on Washington Street between Carlisle and Albany Streets, opened on May 23, 2013. North Cove, on the river between Liberty Street and Vesey Street. Irish Hunger Memorial, located on a 0.5-acre (0.20 ha) site at Vesey Street and North End Avenue. It is dedicated to raising awareness of the Great Irish Famine. Construction began in March 2001, and the memorial was completed and dedicated on July 16, 2002. ^ a b c d "Battery Park City neighborhood in New York". Retrieved March 18, 2019. ^ a b c "City Living: Battery Park City". amNY. January 21, 2014. Retrieved December 2, 2014. ^ Howe, Arthur. "IN N.Y.C., A $1 BILLION DREAM RISES", The Philadelphia Inquirer, June 6, 1982. Accessed August 4, 2007. "Construction already is under way on the southern tip of Manhattan, at Battery Park City, land named for the British fort built there in 1693. The area was expanded by 1.2 million cubic yards of earth and rock excavated for the foundations of the World Trade Center nearby." ^ There Goes The Neighborhood: Goldman Sachs Accused Of Gentrifying Block Around Its HQ. Joe Weisenthal in Business Insider February 8, 2010. ^ "Housing Unit Named Battery Tower". The New York Times. May 25, 1929. Retrieved March 23, 2017. ^ "EXCAVATIONS BEGUN. ; Steel Sheeting Is Being Used for Battery Tower Work". The New York Times. December 8, 1929. Retrieved March 23, 2017. ^ Kreuzer, Terese Loeb (June 6, 2012). "Battery Park City creators reminisce about neighborhood's past". Downtown Express. Retrieved October 18, 2018. ^ "Megajob takes foothold in fill, New York City's $1-billion river development survives snags". Engineering News-Record. April 14, 1983. ^ Shipler, David K. (April 17, 1969). "Battery Park Plan Is Shown". The New York Times. ISSN 0362-4331. Retrieved March 23, 2017. ^ "BATTERY PARK CITY IS GIVEN APPROVAL; Lower West Side Complex to Be Built on Landfill". The New York Times. October 10, 1969. ISSN 0362-4331. Retrieved March 23, 2017. ^ Urstadt, Charles J. (June 10, 1972). "Letters to the Editor: Planned Battery Park City". The New York Times. ISSN 0362-4331. Retrieved March 23, 2017. ^ Oser, Alan S. (February 2, 1972). "DEVELOPER NAMED FOR BATTERY CITY". The New York Times. ISSN 0362-4331. Retrieved March 23, 2017. ^ Seigel, Max H. (July 13, 1972). 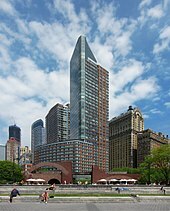 "Planners Cut Low‐Income Units In Battery Park City Proposal". The New York Times. ISSN 0362-4331. Retrieved March 23, 2017. ^ a b Iglauer, Edith (November 4, 1972). "The Biggest Foundation". The New Yorker. ^ "Seats at $25 Apiece Offered at Battery To Watch Big Ships". The New York Times. May 25, 1976. ISSN 0362-4331. Retrieved March 23, 2017. ^ Fried, Joseph P. (October 30, 1977). "Will Battery Park City Ever Rise?". The New York Times. ISSN 0362-4331. Retrieved March 23, 2017. ^ Fried, Joseph P. (July 29, 1977). "Preliminary Federal Backing Given On Long‐Dilayed Battery Park City". The New York Times. ISSN 0362-4331. Retrieved March 23, 2017. ^ Schumacher, Edward (November 9, 1979). "Carey and Koch Accept New Battery Park City Plan". The New York Times. ISSN 0362-4331. Retrieved March 23, 2017. ^ Schumacher, Edward (October 26, 1979). "13 Years Later, Battery Park City's an Empty Dream". The New York Times. ISSN 0362-4331. Retrieved March 23, 2017. ^ Herman, Robin (September 24, 1979). "Nearly 200,000 Rally to Protest Nuclear Energy". The New York Times. p. B1. ^ Goodwin, Michael (May 16, 1980). "Construction of Battery Park City Is Now Scheduled to Begin in June; Construction to Start June 3". The New York Times. ISSN 0362-4331. Retrieved March 23, 2017. ^ Goldberger, Paul (August 19, 1981). "6 BUILDERS CHOSEN FOR HOUSING AT BATTERY PARK CITY". The New York Times. ISSN 0362-4331. Retrieved March 23, 2017. ^ a b Gottlieb, Martin (October 18, 1985). "BATTERY PROJECT REFLECTS CHANGING CITY PRIORITIES". The New York Times. ISSN 0362-4331. Retrieved March 23, 2017. ^ Goldberger, Paul (August 31, 1986). "ARCHITECTURE VIEW; BATTERY PARK CITY IS A TRIUMPH OF URBAN DESIGN". The New York Times. ISSN 0362-4331. Retrieved March 23, 2017. ^ "Vietnam Veterans Plaza". New York City Department of Parks & Recreation. Retrieved February 14, 2014. ^ Pristin, Terry (March 24, 1998). "Battery Park City to Give Middle-Income Renters a Break". The New York Times. ISSN 0362-4331. Retrieved March 23, 2017. ^ Dunlap, David W. (February 7, 1999). "Filling in the Blanks At Battery Park City". The New York Times. ISSN 0362-4331. Retrieved March 23, 2017. ^ Gross, Jane. "AFTER THE ATTACKS: THE DISPOSSESSED; Battery Park City Residents Only Visit", The New York Times, September 17, 2001. Accessed June 23, 2017. "But at the Gateway section of the complex, there were scattered reports of looting, on two Web sites about Battery Park City and from residents who returned home for the first time." ^ "Ground Zero stops burning, after 100 days". The Guardian. December 20, 2001. Retrieved June 23, 2017. ^ Battery Park City Authority Act, L. 1968 ch. 343-44, L. 1969 ch. 624, L. 1971 ch. 377; codified at Public Authorities Law § 1970 et seq. ^ Goldberger, Paul (August 19, 1981). "6 Builders Chosen for Housing at Battery Park City". The New York Times. Retrieved July 29, 2010. ^ "Leadership". bpca.ny.gov. Retrieved December 5, 2018. ^ Scott, Janny (August 1, 2006). "Manhattan: Housing Plan Approved." ^ "Mayor Bloomberg's affordable housing plan" (PDF). New York City Department of Housing Preservation and Development. August 2008. Archived from the original (PDF) on October 16, 2012. Retrieved October 29, 2012. ^ Jacobson, Aileen (August 15, 2018). "Battery Park City: A Resort-Like Community Built on Landfill". New York Times. Retrieved October 11, 2018. ^ Fung, Amanda (April 29, 2009). "Battery Park City condo owners fight spikes in fees". Crain's New York Business. Retrieved November 22, 2018. ^ De Avila, Joseph (May 11, 2011). "Battery Park City condo owners fight spikes in fees". The Wall Street Journal. Retrieved February 11, 2019. ^ Hughes, C. J. (October 21, 2007). "Next Door to a Poignant Memory". The New York Times. Retrieved April 26, 2010. ^ a b Dunlap, David W. "When an Arab Enclave Thrived Downtown", The New York Times, August 24, 2010. Accessed August 25, 2010. ^ Karpf, Ruth. "Street of the Arabs", The New York Times, August 11, 1946. Accessed August 25, 2010. ^ a b "Millennium Point", Emporis.com, 2011. ^ Pogrebin, Robin. "Putting Environmentalism on the Urban Map", New York Times, May 17, 2006; retrieved July 22, 2012. ^ The Solaire website; retrieved July 22, 2013. ^ "World Financial Center and Winter Garden New York City.com : Arts & Attractions : Editorial Review". Nyc.com. Retrieved August 18, 2012. ^ "about". Worldfinancialcenter.com. Retrieved August 18, 2012. ^ Craig, Susanne (April 16, 2010). "Goldman Sachs's New Palace Creates Princes, Serfs". The Wall Street Journal. Retrieved April 17, 2010. ^ "Engine Company 10/Ladder Company 10". FDNYtrucks.com. Retrieved March 14, 2019. ^ "Battery Park, New York City-Manhattan, New York Zip Code Boundary Map (NY)". United States Zip Code Boundary Map (USA). Retrieved March 21, 2019. ^ "Location Details: Church Street". USPS.com. Retrieved March 7, 2019. ^ "Battery Park City New York School Ratings and Reviews". Zillow. Retrieved March 17, 2019. ^ "P.S. 89". New York City Department of Education. December 19, 2018. Retrieved March 21, 2019. ^ "I.S. 289". New York City Department of Education. December 19, 2018. Retrieved March 21, 2019. ^ "Battery Park City School". New York City Department of Education. December 19, 2018. Retrieved March 21, 2019. ^ "Stuyvesant High School". New York City Department of Education. December 19, 2018. Retrieved March 21, 2019. ^ a b c d e f "The New York Public Library, Battery Park City". 1100 Architect. Retrieved February 3, 2014. ^ Zimmer, Lori (June 21, 2012). "Battery Park City Library Achieves LEED Gold Certification". Inhabitat. Retrieved February 3, 2014. ^ "Atelier Ten Official Website". ^ Kim, Sheila (January 26, 2012). "Interiors Award 2012: Public Space". Contract. Retrieved February 3, 2014. ^ Tarricone, Paul (April 1, 2012). "Welcome to the Neighborhood". LD+A Magazine. Retrieved February 3, 2014. ^ "Brookfield Place Terminal". NY Waterway. Retrieved January 12, 2019. ^ Aline Reynolds (November 14, 2012). "Washington Street to gain public plaza". Downtown Express. Retrieved June 17, 2014. ^ "Brian Tolle Irish Hunger Memorial, 2002". Battery Park City Authority. 2002. Archived from the original on September 26, 2012. Retrieved February 1, 2014. ^ Smith, Roberta (July 16, 2002). "A Memorial Remembers The Hungry". The New York Times. Retrieved July 10, 2010. ^ Marino, Vivian. "Tyra Banks’s Mansion in the Sky Is on the Market", The New York Times, March 31, 2017. Accessed June 23, 2017. "The supermodel and TV personality Tyra Banks has decided to sell her Battery Park City home, a mansion-size duplex facing the Hudson River, complete with dressing room and hair salon, a personal gym and separate staff and guest quarters.Ms. Banks bought her Riverhouse apartment, at 2 River Terrace, in 2009 and used it as a primary residence for about four years." Wikimedia Commons has media related to Battery Park City.